While a lot of warehouses are content to just place things on pallet racks and call it good, there’s actually a lot you can do to maximize your existing pallet rack space and make sure everything is stored as carefully as possible, while ensuring there’s extra room in the warehouse for other goods as well. Reduce aisle space: One of the best ways to maximize the space around your pallet racks is to reduce the width of aisles between them. Many warehouse aisle widths are determined by guidelines put forth by forklift manufacturers, local safety regulations, and the like, but in a lot of cases for pallet racks you can reduce these widths to the minimum required size to increase the amount of warehouse shelving you can include while maintaining a steady traffic flow (particularly to areas with less foot-traffic). Reconsider their usage: A lot of warehouses use pallet racks for standard daily tasks like picking or shipping/receiving, but in many cases you can actually repurpose some of your less-populated racks for case flow and/or full-carton processing instead of individual item picks. This obviously depends on a lot of factors such as inventory density and carton flow, but if you have pallet racks with room to spare, converting them to overflow storage and using smaller shelves for daily picking could help make the most of your available space. Use safety panels to set limits: Pallet rack safety panels are a good call in general to protect your workers and your inventory from accidents, but they can also help better measure the amount of product currently on a shelf by providing a hard backstop against which product can sit and act as a guide to how much space you still have to use. 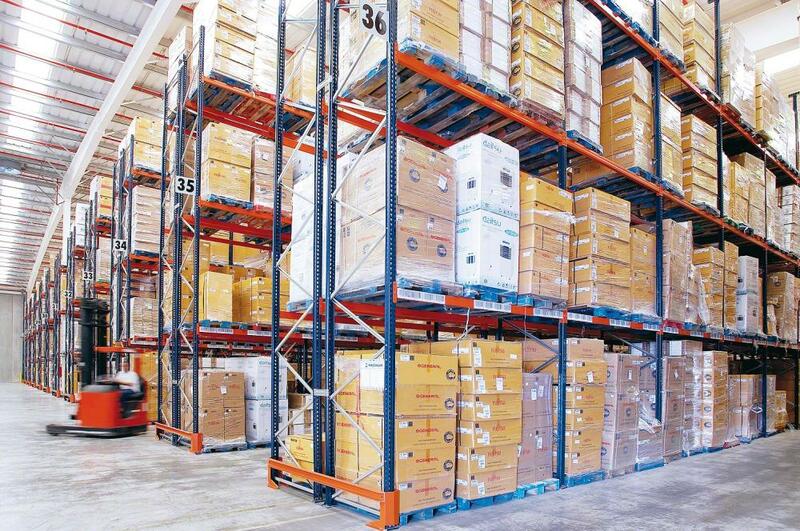 Make racks more mobile: For faster-moving products, it may be more worth it to move some inventory from your stationary pallet racks onto gravity flow racks to encourage product movement. This can help free up space on pallet racks for items that aren’t accessed as much, and may produce a ripple effect where handling times and product movement are improved through mobile storage. Look for unused room space: It might not always be possible, but a good way to improve storage space and free up room elsewhere in an area is to look for lesser-used space in rooms. Try to make sure every corner has a rack in it, look for spaces between aisles that aren’t being utilized, and don’t be afraid to think outside the box – look over doors, under mezzanines, and in other areas that might not be the most common spot for pallet racks.